Well, tonight I had my first-ever disappointing experience with a 5 Spices, 50 Dishes recipe. 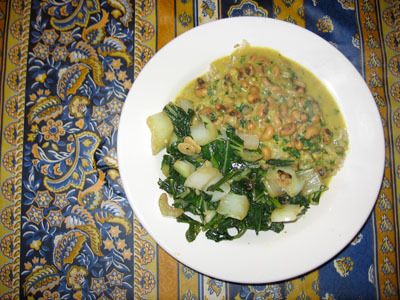 My first response, as I doctored up the tasteless, watery black-eyed pea curry, was anger and a sense of betrayal. But as I realized the specific missing flavors that I was trying to add into the dish – fat and sweet – my eyes strayed over to the empty can of coconut milk – lite coconut milk (it was all I had in the house!) – and I knew I had no one to blame but myself. Well, the curry ended up quite edible after generous infusions of ginger, Earth Balance, salt, and vermouth. (How does vermouth make absolutely everything better?) And I accompanied it with a fabulous side – spicy bok choy and turnip greens stir fried with garlic and ginger. Unfortunately at this late stage in the game I had to compost at least half the turnip greens, which is a shame. I don’t know if I’ve ever cooked them before. I was put off by their prickly texture when they were raw, but once they were cooked I could not get enough of them. Super-yum! With no further ado, however, here is the recipe I used for the bok choy (it’s modified from the internet and I want to make sure I have a copy for the future – it was that good). Heat a large wok or skillet until very hot. Add the canola oil and heat until just smoking. Add the garlic, ginger and chili paste and stir-fry until lightly browned, about 30 seconds. Add the bok choy and turnip greens and a pinch of salt and stir-fry until crisp-tender, 5 minutes. Add the broth, cooking wine and soy sauce and cook, tossing, for 2 minutes longer. Finish with a drizzle of sesame oil.